How do I share a private YouTube video with someone? I have uploaded a YouTube video and marked it as private. Now I want to share it with someone. I have tried to share it a few times, but they have not received any email notification. What is the proper way of sharing the video? Here's what Youtube says for sharing private videos. So, if you're sending the email notifications the way the steps say, then like one of the other answers says, maybe your friends need to add service@youtube.com to their email address book. If you'd like to share one of your videos with a select and limited audience, you can do so by setting your video to private. Once the video's set to private you'll be able to share it with fifty other users. Once you've set the video to private you'll be able to send the video's private URL with your contacts. Once your contacts receive the private URL, they'll be able to sign into their YouTube account and watch the video. Sign into your YouTube account and click the Account link located (at the top-right of any page ). Then click the Uploaded Videos link. Click and choose the video you want to send to your friends. Then, click the "Edit" button. Under the "Broadcasting and Sharing Options" section (on the left-hand side of the page towards the bottom) you'll see "Privacy" options. Click the little black arrow / triangle to expand and see all your privacy options (if its not already open and you cannot see your privacy options). If the video's set to private, there will be a URL section below the "Private" option. This is the special private link that you will send to (up to) fifty contacts so that they can watch your private video. That's it! 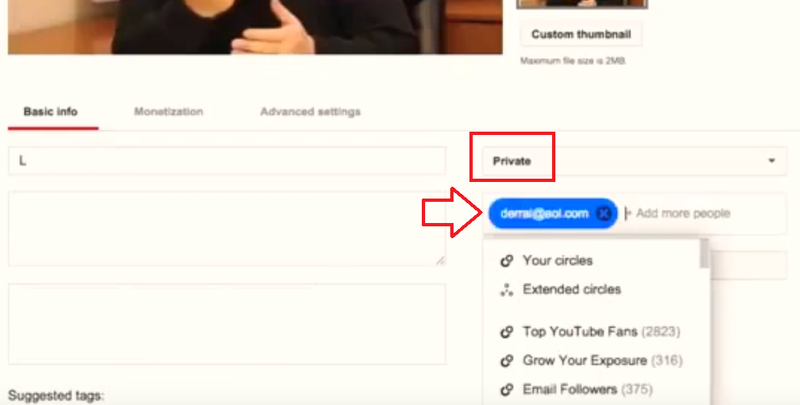 You've now learned how to share a private video with your contacts! Click your account icon at the top right, and select "Creator Studio" from the menu. In the videos panel click the "Edit" button next to the video you with to share. On the "Basic Info" tab, ensure, the privacy is set to "Private". Otherwise, the option to share with specific people will be hidden. On the "Basic Info" tab, click the "Edit" button just under the privacy drop down list. The primary action button to submit the form will say "Share". Click that button to save your changes. Have you read this information from the YouTube site? I would imagine that the email has been blocked as spam. Have YouTube send your friends an email with a link to the video - just sign into your YouTube account, click on the "Share" link underneath any video, and then scroll down to the "Send this video from YouTube" box. Enter any email address you want and an optional personal message, then click "Send"
Share to a social network - just click on your favorite social network underneath a video (e.g. Facebook, Twitter, orkut, etc), sign into that social network (if necessary), and follow the instructions to send the video to your profile or directly to your friends. Having trouble sharing a videos? If your friends haven't received the YouTube videos you've shared with them, please ask them to check their spam folder to see if the emails were filtered there. Adding service@youtube.com to their address book or filter exception list may help avoid this problem in the future. You may also want to confirm that you're entering the right email addresses when you share videos. Not the answer you're looking for? Browse other questions tagged youtube privacy sharing youtube-creator-studio or ask your own question. How do I share private YouTube video? How can I share a private YouTube playlist? Why is someone not allowed to see my private video on YouTube even though I have shared it with them? How can I share a private YouTube video with someone so they can edit and save it? Can / Will Youtube delete my private videos?